During the week, I had a craving for chocolate milk. I love milk, with or without chocolate, but I don't drink very much these days. I feel like it's a waste of calories (I don't have evidence for this, it's a personal theory, okay?). It might be a way to justify eating more cheese, I don't know. But this particular morning, I felt compelled to make chocolate milk. I used real Hershey's Syrup and stirred it with an iced-tea spoon. It really hit the spot. It's afghan season again! 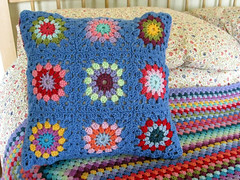 I've been churning out afghans for a couple of years now and I appreciate seeing them put to good use. In this case, there was a stuffed animal under the blanket receiving some sort of injection with a needle-less plastic syringe. I don't know much more than that but I can tell you they were definitely nice and warm for the process, sort of a cozy amateur veterinary clinic, if you will. I've baked two pumpkin pies so far this fall. This was the second and it was excellent. I love pumpkin pie. I'm actually not all that keen on the current trend toward making every single thing pumpkin-spice flavored but I do love a good, old-fashioned pumpkin pie. I will make at least one more this season because it's our traditional Thanksgiving dessert. Our young teetotalers have been enjoying mugs of (lukewarm, herbal) tea sipped through silly straws. They have this on the weekends with breakfast, mostly, but sometimes also on a weekend afternoon. It's been good for them; they sit together at the table and drink their tea while they chat. The conversations I overhear are interesting and sometimes rather hilarious. As it gets colder, they'll have hot cocoa sometimes, especially when they come in after playing in the cold. I'm not sure how the silly straws will fare with the thicker cocoa but I'm sure they'll be game to try. Hello and welcome, new readers and followers! I'm so glad you're here and I hope you enjoy visiting the Thistlebear home. I hope the week has started off well for everyone, especially in the UK with your "hurricane." It's going well here; we spent the morning at the children's hospital with the LB for his regular kidney check-up. He's doing quite well and we're thankful for that. We always feel a little anxious before his check-ups so it's nice to have it out of the way. Now we're very excitedly preparing for Halloween, starting with pumpkin-carving tomorrow! I've had some lovely comments lately about my strawberry-printed oilcloth placemats, which are on the kitchen table and often show up (as above) in my posts. The kitchen is my favorite room in our home and a lot of my photos are taken there. I made the placemats myself last winter from Mexican oilcloth, after I experienced sticker-shock with some ready-made ones available in a local import shop. It was far more affordable to buy a couple of yards of oilcloth on Etsy and sew them myself - even after purchasing a new sewing machine foot suitable for sewing the oilcloth. I posted a how-to on my blog back then; it was one of my very first blog posts. I would love to share the experience, so I have added a link to my sidebar for it, along with some other how-to's I have posted on my blog. None of these how-to's is uniquely mine - that is, I was inspired by the work of others when I made them. But it seems handy to have clickable links to them right on the blog. I'll add new ones as applicable. I was in the mood for a general cleanup of the sidebar anyway; it was looking cluttered. I hope you'll be inspired to try something I've made. Hi Jennifer.. that pie looks yummy.. do you make the crust from scratch? I want to make one of those as it's one of our favorite pies ever. It was fun to see your blanket being cuddled. Enjoy your week! I really love that crocheted Afghan !! I am still busy crocheting scarfs for christmas presents. I like your theory on milk! Ha! Nothing beats a good glass of chocolate milk! And dear goodness lady is your afghan beautiful!!! 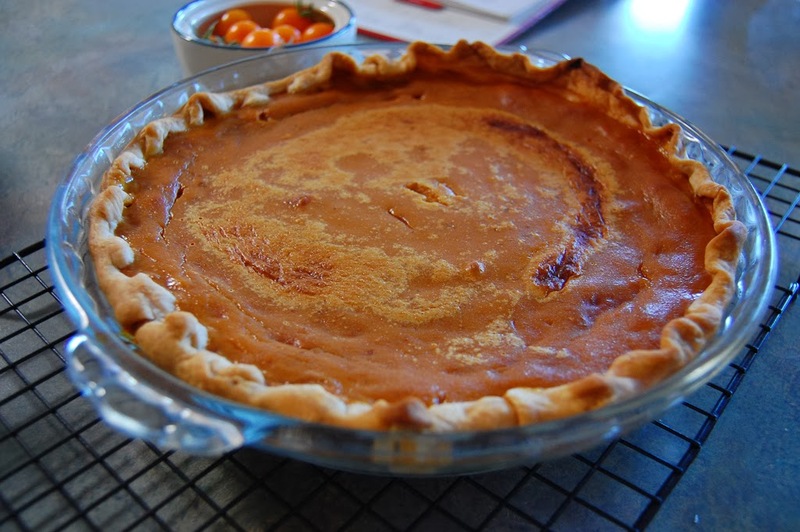 And right on about the pie...it is the number one pumpkin dessert! Loving the happys!! Hello Jennifer, I'm a new reader of your blog and I'm enjoying your family happy posts. My three little ones are now BIG ones and have families of their own. I live vicariously through others with children still at home and having grand adventures with them. Love the afghan and the silly straws. Those sure bring back memories! I love your pie. I have been wanting to make an apple pie this whole month... Will try this week. Love the blanket and to see how much the kids enjoy your work. Hi Jennifer, dare I say it but I dont like chocolate milk! I like hot chocolate but dont know why I dont like it cold. Strange hey! Love the look of the pumpkin pie. I just had my first taste of pumpkin cake this season ever and I loved it! Your pumpkin pie looks delicious. Glad the LB is keeping well. No storm for us in Scotland, plenty of rain but that is usual for us. Love the afghan, it's so nice to see warm woolly things out for snuggling under. So glad LB's hospital check went well, I can imagine it's hard when you have to take him. I like the occasional chocolate soya milk - I have one after a long morning at the allotment sometimes, as a rehydrating, re-energising treat. The pie looks good. I'm thinking of trying a pecan pie this week. Maybe one of the littles will "help" me. No sign of a hurricane here in the southwest, I think we've been lucky. Plenty of rain though. Hope you have a good week Jennifer. The hot chocolate looks very comforting...as does the tea and the silly straws! The afghan looks divine...and the pie scrumptious!! More happy pictures! The pie looks delicious and the afghan looks so cozy! Lovely moments, love the look of you pumpkin pie. Beautiful afghan...and mouthwatering-looking pie! Pumpkin pie is one of my favorites, too. My mom is the expert pie maker in the family, so I'm looking forward to her pumpkin pie at Thanksgiving. That is a beautiful afghan that your little cherub is snuggled under! Yum - pumpkin pie! I often make it without a crust to cut the calories and carbs, but even that way is still very good! I don't know about those silly straws and hot chocolate -- kind of tough to get a big old gooey marshmallow through there! Lovely to see some photos of happy moments at your place. Looks like you had a lovely Happy week Jennifer.......I'm partial to a mug of hot chocolate with a banana and some crystallised ginger on the side, it seems to warm me up on those long cold winter days. 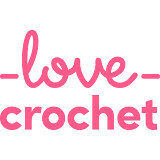 Love your snuggly crochet blanket. I am not a milk drinker, but I can definitely see how chocolate milk would hit the spot. I love the imaginary play going on with the crochet blanket. Pumpkin pie is my favorite. My husband makes a version with agave nectar so I can eat it, YUM! Family and home and pumpkin pie always spell happiness for me too. Love the sweet pic of your little one curled up with your afghan. Have a great week Jennifer! I'm not a lover of milk or milk drinks. We used to have little bottles of milk at primary school with straws stuck in them, the milk was always warm and I think it was that which put me off it. I love cheese though. 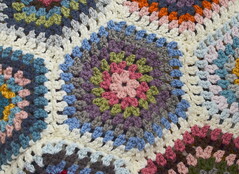 Another beautiful crochet blanket made by your own fair hands. It looks lovely and cosy, perhaps in aran weight rather than double knitting? I've never tried pumpkin pie. Every year I say that I must make one to try and yet another year slips by and I still haven't tried it. Perhaps this year. I never heard of oil cloth before!! Your glass of chocolate milk took me back to junior high and high school, when each and every lunch was accompanied by a small carton of Sealtest chocolate milk! When I get a chocolate milk craving nowadays, which is rare, the milk needs to be VERY COLD, so I stick it in the freezer for a good 20 minutes and then sip it through a boring straw, (I'm not as creative as your kiddies! ), but it definitely hits the spot; creamy and delicious and makes me feel like I'm sweet 16! Love your afghan (and your placemats) I have never made pumpkin pie before but had already decided to try this year and now I've seen yours I will certainly get cracking! Hi Jen, i love the pictures in your posts, these happy ones and the beautiful bright sunny ones from earlier, so nice to see a change from drab old England, although luckily the storm didn't reach the area i live in. Sending lots of continuing healthy vibes to LB! Chocolate milk and snuggling under blankets, that's happy, right there! I love chocolate milk, too. I really love chocolate anything and everything… it's my weakness. I really like your colorful afghan. It's perfect to help brighten a cold, winter day. And your pumpkin pie looks delicious. It's just not Thanksgiving without the pumpkin pie! Hope you are having a great week! Chocolate milk is the best, YUM! :) And, your pie looks fantastic!